Pat Scully wasn’t looking for a new job. But on that day 32 years ago, when 2nd selectman Barbara Butler — like Pat, a Parent/Child Center board member — said that the selectman’s office had an opening, Pat figured, why not? She’d been an administrative assistant in private industry for nearly 15 years. Her current job was with General Datacomm in Danbury. With a young son at Kings Highway Elementary School, the much shorter commute was appealing. After all, Pat lived within walking distance of Town Hall. She began work there in 1981 as administrative secretary to First Selectman Bill Seiden. She continued with his successors: Marty Hauhuth, Doug Wood and Joe Arcudi. Diane Farrell promoted her to office manager. That’s been Pat’s title for the past 16 years. She ran the 5-person selectman’s office — then watched as, with downsizing, it shrunk to 2. Gordon Joseloff will be Pat Scully’s last 1st selectman. She retires Friday, after 32 years organizing 6 chief executives’ calendars, handling their correspondence and — especially — handling complaints. Complaints are a huge part of a 1st selectman’s work. But they couldn’t do it without Pat. “I know where to send everything,” she says proudly. And no, it’s not the trash basket (or, these days, the “delete” button). Each 1st selectman is different. Some are hands-on; others, hands-off. Hauhuth wanted to preserve open space. Farrell — the “Brown Bag Lunch” lady — was known for constituent services. Joseloff has been very concerned with public safety. 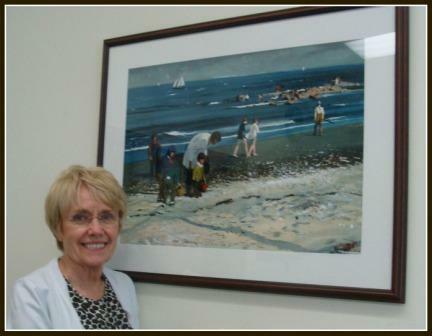 Pat Scully with Hardie Gramatky’s painting of families at Compo Beach. It’s hung above her desk for 20 years. When she lived in Westport, Pat was involved in town affairs far beyond her job. She spent many years on boards of the Saugatuck Congregational Church. Her 1st husband died 20 years ago. She raised her son as a single parent. Now she lives in the Valley. She’s remarried, with a 3-month-old granddaughter. Pat looks forward to seeing her more often. Pat has spent several months training her successor, Eileen Francis. While she won’t miss the drive to work, she will miss everyone in Town Hall. Just as I hope everyone who has ever had business in Town Hall realizes how blessed we are to have had her in the selectman’s office, for 32 fantastic years. This entry was posted in Local politics, Looking back, People and tagged Gordon Joseloff, Jim Marpe, Pat Scully, Westport selectm. Bookmark the permalink. Thank you for a job well done, Pat! Enjoy your retirement, and more time with your family. Pat will be missed. There was never a moment ever when asking her for something that it was not done and always with a smile. Good Luck Pat. THANKS!!!! The best thing about going to Town Hall was the warm smile from Pat. She always knew any information I was seeking. We will miss you, Pat! Thanks for all you’ve done for 32 years. Pat brought so much to this position, she will long be remembered and missed. Pat, you have earned our respect and affection! 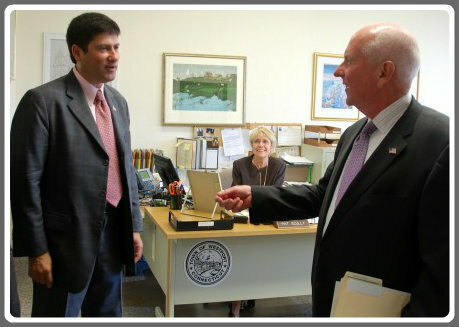 No one quite like you…………..
Dear Pat…as a former 2nd Selectman, you always were there to help or knew what to do…and I loved chatting with you on our families or the latest news. Enjoy your retirement, BUT…you will be missed here in Westport!!! And she hasn’t aged a day in 32 years. What a treasure. Always willing to go the extra mile. Congratulations, Pat, on a well-deserved retirement. Enjoy every minute! Best luck to you Pat. Retirement is great!! I can’t believe I’ve been out of Town Hall for two years. It was was a great place to work. Enjoy!!! Pat, you were THE face of the Selectman’s office–the always smiling face. We’ll miss you but wish you all the best in your well-earned retirement. I’m so glad to have known you. I had the pleasure of working with Pat for a month as a temp many years ago during the Doug Wood administration. Pat was always so professional but at the same time, so down to earth and so fun to work with. From personal experience, retirement is wonderful…you truly deserve it after all those years. The best of luck to you. Pat Scully has been of value to the town and the Selectman’s Office for many years. I have worked twice as a head of a citizen’s committee, most recently with Downtown 2020. I have come to know directly how great a value she was to the work that I was involved. She has ALWAYS gone out of her way to make the work and the work of my Committees be effective. For that I only have high praise for her value! I will miss her because not only am I leaving the RTM, but she is leaving Westport, so I won’t just bump into her when I visit Town Hall. Thank you, Pat, and thank you for the York Peppermint Patties that Sue Brown and you always had. Now you know why I stayed an additional two years!